As I read the Sunday advertisements yet again this year, all the floral departments of the local big box stores from grocery to department to home stores were filled with great, bargain options. With the Holidays upon us-of course they are full of holiday flowers, poinsettias, and wreaths. With that, I will explain the offerings, the prices, and of course the claims for you to make your own conclusions on the real price of the decorations and if they are really a bargain….and for whom. 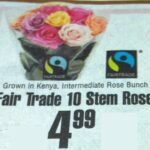 Here is a 10 stem bouquet of roses with the certification of Fair Trade Kenya. First lets understand Fair Trade certifications. It is not affiliated with government and defined for those South American, African, etc. growers who are acting sustainably in some way whether by labor, environment, or social standards. This could mean anything from offering child care to recycling of water to a comparable wage. Most teach/employ disadvantaged communities a skill and support the local labor force with a fair wage. It sounds wonderful and really is a start to a greener mindset, but… it is the most loosely veiled certification unfortunately, when concerning flowers. 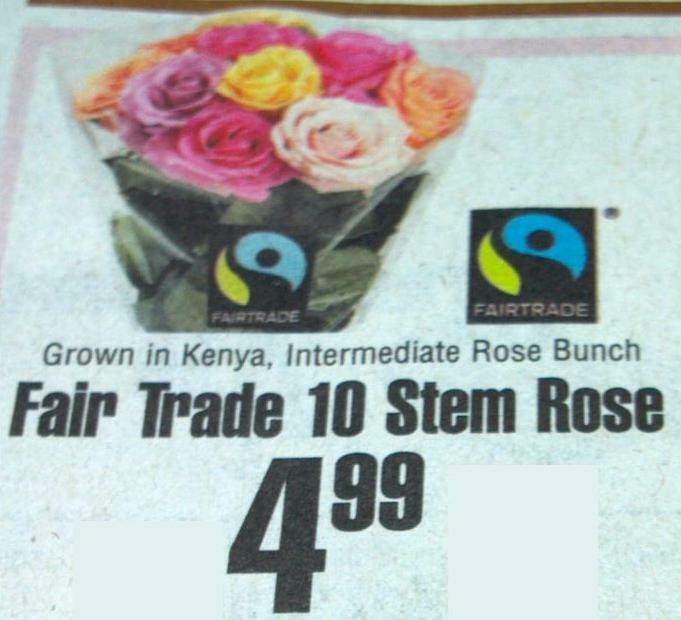 The first thing from this ad of course is, how fair of a wage can a worker make with these roses selling for under $5.00? After, being grown, flown, and transported to the various US outlets. The same way discount stores sell Chinese made $1.00 goods? I leave you to figure that one yourself as it is kind of obvious. In fact just a few months ago, local African activists burned to the ground a huge SA owned flower farm they said was poisoning their water and ruining their land. It is said, the grower is pulling out of Africa now. Pictured here is a stem of ‘oriental’ lilies; however, these are not oriental lilies. There is no certification stated and the ‘bunch’ size is unclear. There are three main classifications of lilies imported to the US. 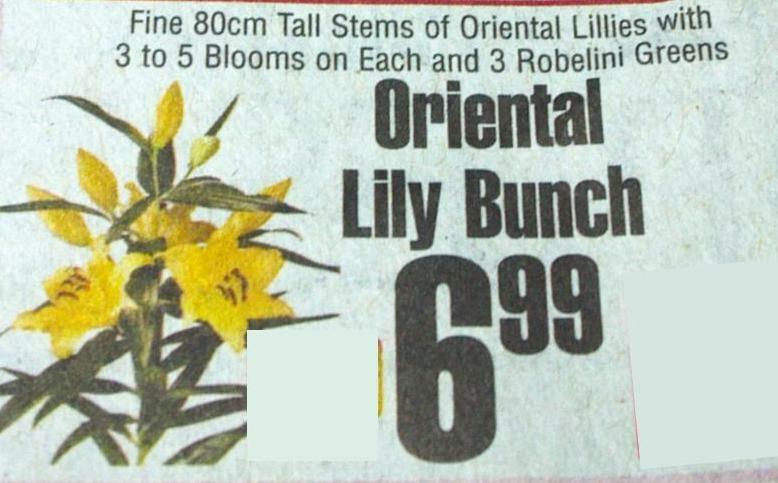 This ad has a photo of one of the most expensive and lilies from Holland, but it is logically impossible to be an oriental variety as advertised. 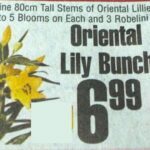 They are in fact, advertising the small Asiatic lilies from South America in a bunch? Lilies are a single stem, bulb so they take up a bit more space to grow for less flowers . As for any sustainable certifications, there is none here as with most imported goods. I am sure the issues with this ad are pretty clear. 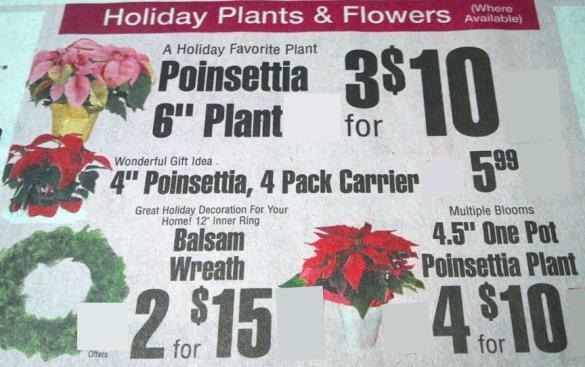 Here is a multitude of poinsettia options and a balsam wreath. There are 2 types of poinsettias plants in general circulation. 1-A single plant with a single bloom, which a pot can have 4 or 5 single plants, and can be 10”or 4’tall. 2-A single plant with multi blooms. These are pinched to create side blooms and traditionally a shorter plant. There are small local growers, but very few mega, commercial, poinsettia growers in the US; with most being only in the temperate states. With that, nearly all the poinsettias you see here in the states are grown in the Canadian Provinces. Sadly, they are only plastic sleeved and sent on a bumpy, cold, truck journey from their protected greenhouses. Which, is why by Dec. 24 they look pretty unhappy in your home and on clearance with curled and wilted leaves. They not only have had a traumatic journey in and out of cold temperatures, but they are lacking the proper care in cold doorways or fruit departments; which ironically emit ethylene gas that further lessens their lives. Poinsettias are a tropical plant native to Mexico and very fragile creatures-more so than even your favorite houseplant. When you purchase local grown, you get a healthier plant that will easily last until it’s time to put it in the summer garden. Plants are a living thing and supposed to live on; when you purchase one you take on the responsibility of the care of this living thing not unlike a pet, and not just a disposable decoration. Here in the US approximately 15% of the evergreens are cut on the West coast and the upper northeast, with the other 85% from Canada. The wreaths shown here are a single faced, wreath; and little known that they are made from evergreens cut in October; stacked, and held for trucking in mid November. Ever notice how they are kind of flat and dry? The month of dry storage does this, and also why they shed so many needles every time you open your door. There are tree farms just for cutting, but many of the evergreens are cut from virgin forests; something I really don’t want on my conscience or my door no matter how cheap they are. It’s your choice. Every year we see them; the miniature evergreen trees in foiled pots laden with plastic ornaments. As a certified tree lover, I cringe wishing I could buy them all and take them home. Most are outdoor varieties and can only withstand a dry and warm house for so long-not unlike the cut live tree in your living room. To live they need special care to hold them for planting in the Spring. 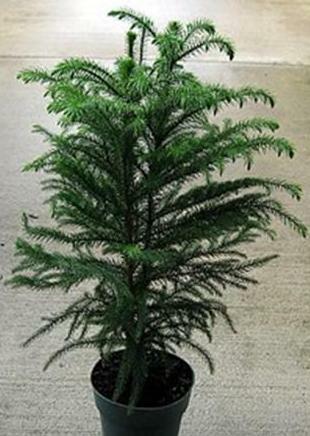 There also are pallets of Norfolk Island pines in every store from drug to home improvement outlets. They are temperate house plants native to the Norfolk Islands and landscape trees in Florida where they grow 3 stories high- and not really a true pine tree at all. They are a very soft hearted plant usually dusted with sparkles and smothered with bows & ornaments on its delicate branches. These should be purchased as a tropical, houseplant and treated as such. They are not cold hardy, and will definitely freeze. It always amazes me how tenacious all the houseplants in these outlets try their best to survive. If you take a moment to think about the history and quality of all your holiday decorations, you will find some of the little secrets in the trade and mass markets. The cheap plastic everything sold everywhere actually come at a huge price somewhere. Imported flowers come with numerous environmental & social issues attached with fancy marketing slogans and misleading information. Stressed plants are doomed the moment they leave the greenhouse and not a good or compassionate bargain. The stale, dry evergreen wreaths were alive and healthy a month ago and now seem only good for mulch. Add in that these items are all treated with an assortment of chemicals for all sort of preventive, preserving, pest and disease; then we are all using our natural resources in a detrimental way. For sure, these poor communities around the world are glad to have any wage, but so would our own homeless population and farms here. Wouldn’t it be nice to have a Fair Trade certification for economically and depressed communities in the US? That would really attack our unemployment and something to label for. I only ask that you think before picking up that bunch of flowers at checkout, or grabbing that wreath while you are buying a drill; or asking just where it came from. Spend your dollars wisely on quality for yourself and your gift recipients at local venues. Money talks, it always has. And we just have to realize that maybe a fresh and beautiful, local grown wreath is not $9.99 and you have a limited budget. Well, how about making your own decoration then? It would sure be fresher and more meaningful; and…. I think you would see that $9.99 isn’t near enough what your creation is worth.